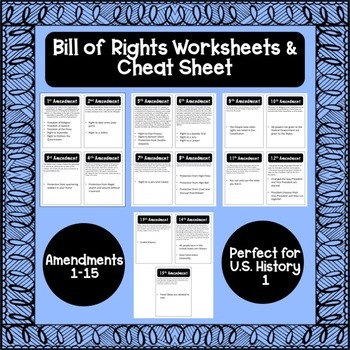 The Bill of Rights is essential for every U.S. History class, but it is a lot for the students to learn. 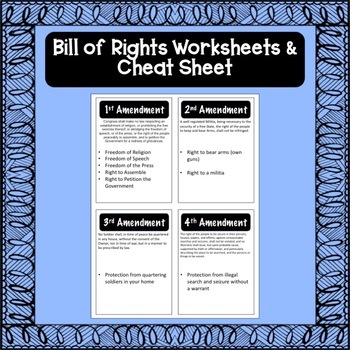 I created this cheat-sheet for my class to use, it has the entire bill of rights (both in the original text and a bullet point synopsis) and includes the next 5 amendments, so that they can have them all in one place. 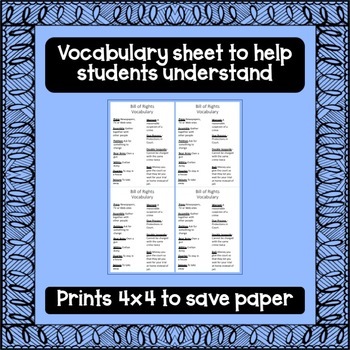 The cheat-sheet is good for review, notes, quick-reference and for the students to make flash cards from. Also included is the vocabulary the students will need to understand the first ten amendments. Without it they are just memorizing empty words and cannot relate the ideas to real-life. 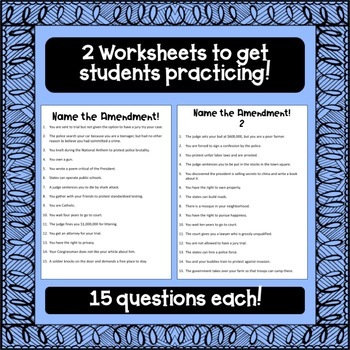 The two worksheets included are fun for the students and get them thinking about what the amendments mean by giving them scenarios and asking them which amendment they apply to. Each worksheet contains 15 scenarios and the students can typically complete them in 10 minutes or less.